Take a drive down the Las Vegas Strip and you’ll catch a glimpse of one of the world’s newest and most luxurious casinos, the SLS Las Vegas. Formerly The Sahara, the property reopened on August 23, 2014 after undergoing $415 million in renovations. The event marked the biggest casino opening in Las Vegas in 2014 and represents the third incarnation from the luxury hotel chain SBE Entertainment following their openings in Beverly Hills and South Beach. The SLS Las Vegas reopened in 2014 after undergoing $415 million in renovations. The hotel and casino complex contains 1,622 rooms, nine restaurants, two pools, seven nightlife venues, a fitness center, retail shops, and a spa and salon. Located on the northern end of the Strip, the luxury casino and hotel altogether include 1,622 rooms, nine restaurants, two pool playgrounds, seven nightlife venues, a fitness center, retail shops, and a spa and salon. Walk through the many corridors of the SLS Las Vegas, and you’ll experience a unique work of art, with “only in Vegas” touches. The hotel divides into three distinct towers, each with different themes that showcase different art collections and quirky decor. The SLS Las Vegas represents a work of art in itself and features contemporary pieces all throughout the hotel and casino. Even the elevators have a creative touch. The SLS Las Vegas might be a newcomer to the Vegas scene, but prior to its renovation, The Sahara hotel stood in its place. Between 1952 to 2011 the Sahara represented an icon in Las Vegas history and was one of the last remaining “Rat Pack” hotels. Famous performers included Frank Sinatra, Dean Martin, Sammy Davis Jr, Judy Garland, Marlene Dietrich, Tony Bennet, Bill Cosby, Louis Prima, George Carlin, and Sonny and Cher. In 1964, the Beatles stayed at the hotel while playing two shows at the nearby Las Vegas Convention Center. Prior to its renovation, The Sahara hotel stood in place of the SLS Las Vegas hotel. Between 1952 to 2011, the Sahara represented a Vegas icon and featured famous performers like Dean Martin and Frank Sinatra. Experience the pinnacle of style and innovation in the SLS casino. As soon as you step into the hotel’s gaming rooms, the sights and sounds of 800 video poker and slot machines greet you at the door. The gaming floors also include 74 classic table games including high limit blackjack, double deck blackjack, six deck blackjack, single deck blackjack, blackjack switch, midi-baccarat, EZ baccarat, mini-baccarat, fortune Pai Gow poker, big 6, roulette, casino WAR, craps, ultimate Texas Hold’em, let it ride, crazy four poker, and three card poker. In addition, guests can place bets at the race and sports book center hosted by William Hill . The luxurious SLS Las Vegas Casino offers 800 machine games and 74 table games. The SLS Las Vegas casino complex offers far more than just gambling. In addition to its lavish gaming halls, guests can soak up the sun by the pool or sip cocktails at the Foxtail Pool Club during the daytime. At night, the many clubs and bars within the hotel complex often host some of the world’s best DJs and musicians in a luxury atmosphere. During the day, guests can relax in style by the pool at The Foxtail Pool Club opened from 9 am to 5pm. In between partying and gambling, guests need a place to feed their appetites. Choose from a number of dining options including Bazaar Meat from famed Spanish Chef Jose Andres. The James-Beard award winning chef has created a groundbreaking culinary experience with a restaurant that celebrates meat in all its forms. The menu features suckling pigs, beef rib steaks, Cheatubriand, Iberico pork loins, tartar bar, wild game, offal, and Butifarra spirals, all served as shared dishes. Silver crocodiles hang above the mirrors in Bazaar Meats, a restaurant from James Beard award-winning Chef Jose Andres. SLS Las Vegas has an additional eight restaurants including Katsuya by Starck, a project in which Master sushi Chef Katsuya Uechi and design impresario Phillippe Starck have teamed up to create a culinary experience to satisfy all of the senses. The menu features unique cocktails paired with outstanding sushi rolls and sashimi. Guests can also check out the Mediterranean inspired Cleo which takes its inspiration from the legendary Egyptian Queen, Cleopatra. Other dining options include an outpost of Umami Burger, Ku Noodle, 800 Degrees, The Griddle Café, and The Perq. Guests can work off all of that eating and drinking at the hotel's large fitness center that comes equipped with treadmills, ellipticals, and stationary bikes. 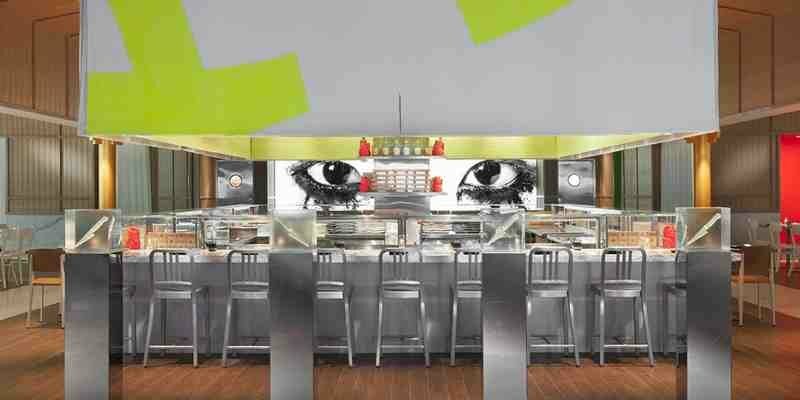 SLS Las Vegas' sushi restaurant Katsuya by Starck satisfies all of the senses. From its lavish gaming rooms to its fine dining options, the SLS Las Vegas makes the perfect choice for gamblers looking for a luxury casino vacation.